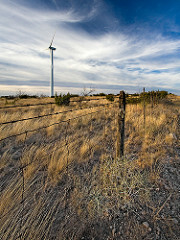 Leading the charge is Texas, which widened its lead over states by installing almost 2,700 megawatts of wind power last year. Only two countries in the world installed that much wind in 2008. In fact, if Texas were a country—an idea never entirely out of fashion in the Lone Star state—it would rank 6th in the world in wind power capacity. To get an idea just how explosive wind power’s recent growth has been in Texas, look at the sprawling 19th congressional district in the northwest part of the state. That single (Republican) district has about as much wind power as all of Denmark, and more than 10% of all the wind power in the entire U.S.